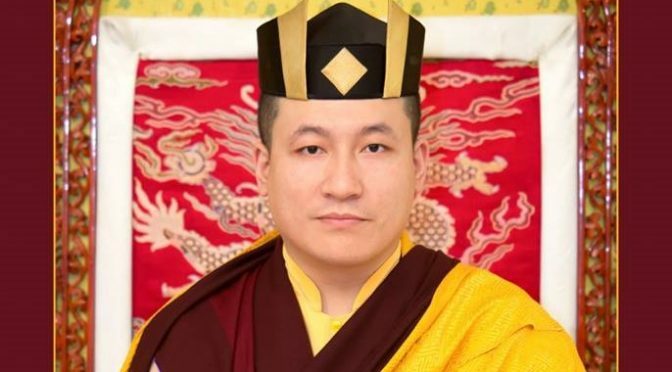 #Karmapa’s message for today’s UN International Day of #Peace. I believe that few of us really know what ‘peace’ means. We may wish for ‘peace’ or do something ‘in the name of peace’, and though our motivations have merit, we really can have no idea whether our actions, gestures or words really contribute to this idea of peace. We may be religious people, philosophers, scientists, politicians, doctors,­ – but who can say that they have really understood what peace is? We can use sophisticated words, logic, actions, but that still really won’t pinpoint peace ­– it still won’t achieve peace. Having said this, it doesn’t mean that if we do something in the name of peace that there is no value. However, the real value lies in what we can do right now to motivate ourselves: we can aspire to seek peace, for ourselves and for others ­– even if we don’t know exactly what it is. Therefore, it is better not to tire ourselves out by thinking ‘this is peace’ and grasping at the concept – we will never get it right. But one thing we can get right, is to know that we want this thing called peace. Even though nothing else might be clear, the aspiration is clear, and this is what really matters. So I would like to ask everyone to use not just the UN International Day of Peace, but every day, to sustain your aspiration for peace, your longing for peace. We have all been born as human beings and as such we have the precious and unique opportunity to aspire to peace. Most beings wouldn’t even have this chance due to so many obstacles. So please don’t lose this opportunity to aspire for peace. In order to support this aspiration, I would ask everyone to learn, contemplate and meditate. What I mean by ‘learn’ is to educate yourselves about the nature of compassion, the nature of wisdom. And then whatever you have learned, examine it closely, and reflect on it. Then, whatever you have deduced from deep listening and contemplation, meditate on that. When you do this, you will be meditating on the basis of compassion and wisdom, a state of mind where there is no grasping and no judgment. Take five minutes a day to start with: just meditate; calm yourself; focus on the non­grasping of any thoughts; any ideas of any kind, whether they are positive or negative, necessary or unnecessary, important or unimportant. During these five minutes, lose everything – lose yourself from any thoughts. And when you do this, the aspiration for peace will naturally emerge.